Mon., April 30, 2018, 8:23 a.m.
WASHINGTON – President Donald Trump on Monday floated the idea of holding his planned summit with North Korean leader Kim Jong Un in the Demilitarized Zone that divides the Koreas. 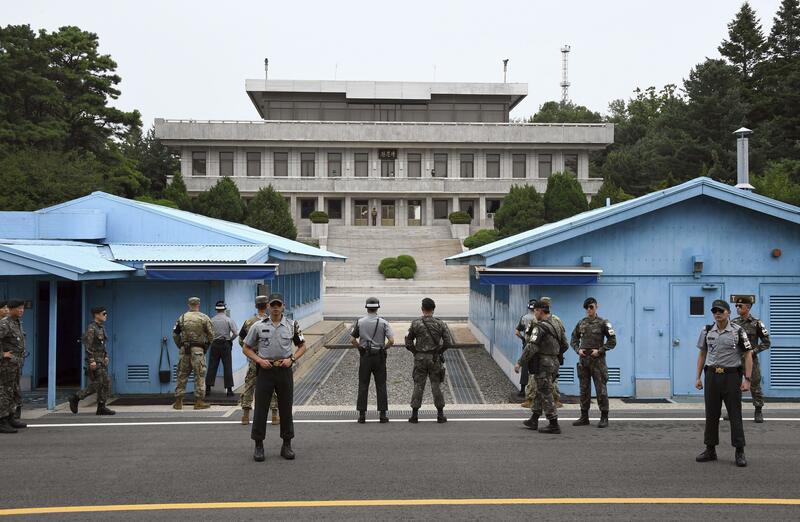 That’s where South Korean President Moon Jae-in met Kim on Friday, the first time a North Korean leader has visited south of the demarcation line that divides the rival nations. “Numerous countries are being considered for the MEETING, but would Peace House/Freedom House, on the Border of North & South Korea, be a more Representative, Important and Lasting site than a third party country? Just asking!” Trump tweeted, referring to buildings located on the southern side of the DMZ. It’s the heaviest hint that Trump has dropped about the possible location for his planned face-to-face with Kim. Trump said over the weekend that the time and location of the meeting with Kim, slated for May or early June, are being set. It would be the first U.S.-North Korean leadership summit in more than six decades of hostility since the 1950-53 Korean War. Trump has previously said that five locations were being considered, but on Friday said the choice had been narrowed to two or three. He hasn’t specified other possible locations, fueling speculation on where would be acceptable to both sides. Other options might be in Europe, Southeast Asia, Mongolia or even on a ship in international waters. Trump on Friday claimed credit for the inter-Korean summit, which has spurred hopes of peace on the Korean Peninsula after a torrid 2017 when North Korea rapidly advanced its development of nuclear weapons and ballistic missiles. The president now faces a burden in helping turn the Korean leaders’ bold but vague vision for peace into reality. Kim and Moon pledged to seek a formal end to the Korean War by year’s end and to rid the peninsula of nuclear weapons. According to Seoul, Kim told Moon that he would shut down his country’s only known nuclear testing site and allow outside experts and journalists to watch the process. South Korean officials also cited Kim as saying he would be willing to give up his nuclear programs if the United States commits to a formal end to the Korean War and a pledge not to attack the North. Kim had already suspended his nuclear and missile tests while offering to put his nukes up for negotiations. But there is still deep skepticism over whether Kim is truly willing to negotiate away the nukes that his country has built after decades of struggle. Published: April 30, 2018, 8:23 a.m.